An Atomic Force Microscope (AFM) is a highly versatile tool that is used by researchers, engineers, and other professionals who require accurate imaging and characterization of samples at the nanoscale. It enables users to measure chemical, electrical, mechanical, and a broad range of other surface properties according to their needs. It also offers significant power to manipulate molecules and atoms, allowing users to fabricate materials and build structures at nanoscale resolution. Although AFM technology is versatile and powerful, its adoption has been considerably slow. This is mainly because of the complexity of the system and the learning curve to use them efficiently. The earliest commercial AFMs, which were created at the time when Park Scientific Instruments was born, focused mainly on ensuring the reliable operation and consistent outcomes of the technology. Although these early systems offered unprecedented resolution in nanoscale imaging, they were not easy to use, and required specialized training. The second generation of AFMs placed emphasis on enhancing the accuracy and versatility of AFM technology. AFMs started to incorporate varied measurement methods during this time to address increasing research needs. Around the same time, Park Systems launched True Non-Contact mode. True Non-Contact mode is a non-contact scanning technology, which allows users to image samples without touching them. This technology brought a significant improvement to AFMs, providing accurate and sharper molecular and atomic resolution imaging, increasing sample preservation, reduced probe replacement costs, and maintenance of tip sharpness. Imaging versatility was also improved with the ability of non-contact technology, which can sense force not only from the bottom (as is the case with tapping or contact mode) but also from the sides. However, the technology required a hands-on approach by professionals with special training that was time consuming. Much like how the point-and-shoot technology in cameras has revolutionized photography, the Park SmartScan AFM system operation software in Auto mode has redefined AFM technology by introducing simplicity into AFM systems. As with point-and-shoot cameras, users can point to a target area and click a button to automatically obtain a high-quality image comparable to that taken by an expert in just a fraction of time spent with the instrument. Figure 1: The user interface of Park SmartScan. This new AFM operation software enables novices to acquire images and data rivalling those produced by veteran users. Park SmartScan’s automatic technology does not require highly skilled professionals like previous AFM scanning solutions. This technology significantly simplifies the scanning process and allows almost anyone to obtain high-quality AFM images at high nanoscale resolution. The following sections compare the steps necessary to operate a conventional AFM and those required to operate a Park SmartScan system. Find the resonant frequency of the cantilever by conducting a frequency sweep. Choose the optimal frequency from the sweep amplitude-frequency value by adjusting the drive magnitude and monitoring the frequency-amplitude graph, simultaneously. Move the Z-stage down to the surface of the sample while visually examining the sample and tip distance. Lower the focus stage to view the surface of the sample. Move the focus stage up to view the cantilever, and estimate the distance between the sample and the tip. Move the Z-stage down slightly. Repeat steps 3-6 until the desired distance between the sample and the tip is achieved. Select the area of interest to scan by moving the stage while optically examining the sample surface. Make the “approach” by moving the Z-scanner further down until the tip of the cantilever is just touching it (contact scan) or just above the sample (~10 nm for non-contact). Slowly lift up the Z-stage until the signal in trace window is clear. Make a second frequency sweep to optimize the amplitude value and frequency. Repeat the approach for increased accuracy. Perform a “Line Trace” to determine the optimum scanning parameter values depending on the line trace data. The parameters that need to be set are Z Servo Gain, Set Point, and Scan Rate. Scan the sample. Adjust scan parameters, and repeat above steps 2 to 14 if the image quality is not satisfactory. Click “Setup” - This opens an animation to guide the user in placing the sample in position. Click “Position” – This makes the system perform a completely automatic frequency sweep, z-stage approach, and also auto-focuses the image. User points the region of interest. Click “Image” - The system will automatically adjust setting for optimal image quality, scan the sample, and generate the image. The Park SmartScan can perform an AFM imaging in just three simple steps. Several iterative steps of complex input are required from the user in a conventional AFM technology. 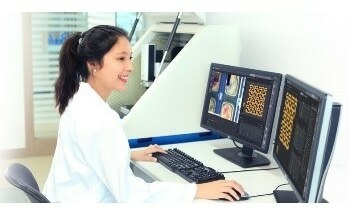 Engineers and researchers can perform repetitive imaging in considerably less time with Park SmartScan technology while dedicating more time for other work, significantly increasing their productivity. How Does Park SmartScan Work? Park SmartScan independently performs all of the steps in the imaging process. The user needs to place the sample on the stage, select a region of interest, and indicate the desired scan size. Then the software accomplishes the rest with the click of a button. The frequency sweep for the cantilever will be automatically performed by the system. It will also move the Z-stage to the sample, and auto-focus the sample to allow the user to see and navigate the region of interest for imaging. The system will also set all the required parameters for optimal setting, engage the cantilever, and start scanning the sample. The scanning will take place without any further action from the user, until the image is acquired and completed. But How Does the Process Actually Work, and Why is it only Now Being Implemented? The tip and the Z stage must be moved in very close to the area of interest after placing the sample on the stage. This is not an easy task. Park SmartScan technology employs Park’s own proprietary True Non-Contact AFM technology to automate the procedure using two patent-pending methods. Park’s True Non-Contact capability enables the Z scanner to approach the sample automatically. The speed of the Z scanner as it is controlled by Park SmartScan is also considerably higher than that of a conventional manual approach. FastApproach™ is a technique developed by Park Systems. It monitors the cantilever’s amplitude change under resonance at the time of the approach. This enables the system to determine the exact moment to slow down and stop moving a few nanometers near the sample. AdaptiveScan adjusts the scanning speed to the sample topography dynamically to maximize the scanning speed while still retaining the high image quality. Developed by Park Systems, this technique scans the first line at regular constant speed. It then uses scan data from the previous line to scan subsequent lines at variable speeds, which self-adjust in real time. The True Non- Contact™ mode scanning technology, which senses force both at the bottom and sides of the sample, makes this technique possible. This enables making automatic modifications on the fly. Numerous other automation features have also been incorporated by Park SmartScan to make the procedure more user-friendly. Customized scanning automation can also be created easily because of the built in macros and scripting. This simplifies many complex repeated scans. Park SmartScan also comes with a cleaner, more discerning user interface than competing programs, which makes it easier to use and eliminates the requirement for any special training for its operation. Figure 2: The self-optimizing Auto mode of Park SmartScan allows users to quickly emphasize either absolute image quality or scanning speed during data acquisition. The software’s Manual mode allows for finer scan parameter control for more advanced operations. Park SmartScan is the first AFM technology in the new generation to bring AFM technology to the masses. This special software makes powerful nanoscale imaging technology easier and more efficient by automating procedures that once needed highly trained professionals to monitor them. The risk of human error is also significantly reduced as Park SmartScan offers a highly accurate and repeatable means of nanoscale imaging. The system sets a new benchmark for AFM technology, ushering in a new generation of AFMs and the high quality research data obtained through their use.